This, of course, is the title of George Eliot’s classic novel about loss and gain, hatred and love, sin and redemption. But for generations of Maggie Mileski’s students, it is also a byword. For us the name Silas Marner stands for terror in the classroom, for our cold indifference towards literature transformed into reverence for learning, and for Mrs. Mileski’s own disciplined learning ordered to cultivating wisdom in us. But only a gifted teacher could bring about such a change in sullen adolescents, and what a gifted teacher she was. It is thirty years this August since I became Maggie’s student, and in those days I was an atheist who dreamed of being a physicist. I thought that reading Silas Marner and all the rest was a dreadful waste of time, and I told her so. Early in the first term of my sophomore year, I sat in Mrs. Mileski’s classroom one afternoon and explained with all the arrogance of youth that I was taking her course only because I had to and that I regarded the study of English literature as far beneath the dignity of real learning in the serious disciplines of math and science. With a knowing twinkle in her eye, Maggie thanked me for condescending to attend her lectures and asked only that I fulfill the course requirements. That year passed quickly, and in the first semester of the following year I was back in Maggie’s classroom at her request so that she could ask me very gently to stop correcting my junior year English teacher with the constant refrain, “But that’s not what Mrs. Mileski taught us.” It may be thirty years since I sat in Mrs. Mileski’s classroom, but I have never stopped being her student. Maggie Mileski was the first Catholic I ever knew, but to the best of my recollection she never explicitly discussed her faith in the classroom. Her task was to teach us the rules of grammar, the techniques of writing, and the glories of the English language, not to catechize us. And yet without ever mentioning the Gospel of Jesus Christ in so many words, she bore eloquent witness to the Truth who sets us free, the eternal and incarnate Word of God. Maggie taught us to revere all things good and true and beautiful, and in so doing she was planting seeds of the Word which helped prepare her students to receive in another time and place the grace of saving faith in the Word made flesh. Maggie also insisted that we implicitly honor our Creator by working honestly to the very highest standards and to the uttermost limits of our gifts. She sought to open our hearts and minds to the wonders of love, and she formed our souls in the perennial wisdom of Christian civilization reflected in classical works of literature. But how and where did she get all this? Who taught the teacher? Long before she became Magdalene Mileski, she was Magdalene Parker. From her parents and siblings she learned the Gospel of Jesus Christ, and through Christ’s Church she was born again in Baptism and nourished with the sacraments of the New Covenant. In the late 1940's the young Maggie was taught by the famed School Sisters of Notre Dame at the College of Notre Dame in Baltimore, the first Catholic college for women to grant the four year baccalaureate in the United States, and from the Sisters, accomplished scholars all, she acquired the intellectual habits which shaped her mind and her character for the rest of her life. Then, over a span of four decades, Maggie honed the art of teaching to near perfection at the high schools of Elizabethtown, East Mecklenberg, and our beloved Ragsdale. But this splendid teacher learned her most important lessons not in the library or the classroom; rather, she learned them in the school of the solemn and sacramental covenant of marriage with her beloved husband, Raymond, who completed her transformation from Miss Magdalene Parker into the teacher of legend, Mrs. Magdalene Mileski. By the time Raymond and Maggie were retired, I was no longer an atheist. Indeed, I was by then already studying for the priesthood, and they both took great interest in my path to the altar. 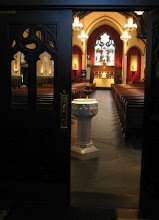 During those years of healthy leisure, Raymond and Maggie gave themselves fully to what they had already done for many years as time permitted: they served the residents, the staff and the Sisters of Maryfield Nursing Home with the gift of sacred music, and they gave their all to the upbuilding of this parish church, their spiritual family. But at length the years of healthy leisure gave way to the long struggle of illness and the losing battle we all fight with time and gravity, and in the suffering which attended those years, Maggie began to understand ever more deeply the eternal wisdom of Holy Scripture: For everything there is a season, and a time for every matter under heaven: a time to be born, and a time to die; a time to weep, and a time to laugh; a time to mourn, and a time to dance. And as her understanding grew with suffering, Maggie began again to teach. She taught us how to surrender gracefully the things of youth; how to offer our trials in union with the suffering of Christ; how to live in the sacrament of the present moment with childlike confidence in the tender mercies of the Savior. Now, make no mistake: Magdalene Mileski was tough. How else could a woman who stood barely five feet tall reduce to quivering fear the largest and most aggressive students? And even with the passing of years, Maggie never lost her edge. She could be sharp, impatient, and blunt. But Maggie’s dissatisfaction with compromise came from her lifelong desire to see things all things be made perfect, or as nearly perfect as the frailty of the human condition permits this side of the Kingdom. And the thing she most wanted to be made perfect was her own soul, fallen, wounded, and sinful as we all are, but striving always by conversion to be conformed to that which is good, and true, and beautiful. Striving always, in other words, to be conformed by grace through faith to Christ Jesus, and Him crucified. “Amen, amen, I say to you, whoever hears my word and believes in the one who sent me has eternal life.” Maggie knew in the depths of her soul that the Gospel of Jesus Christ is the power of God unto salvation for all who believe, and in loving all that is good, and true, and beautiful she learned to love Jesus Christ above all others and all others for Christ’s sake. As daughter and sister, as wife and aunt, as teacher and friend, Maggie lived her life from beginning to end as a faithful disciple of the Lord Jesus, and in so doing she drew countless others to walk with her in the Way of the Cross. Ten years after my conversion to Christ, I was traveling in England with two seminary classmates, and during a long drive through the glorious English countryside, we were trying to sort out the mysterious workings of grace that had led each of us to the improbable vocation of being priests. As we thought out loud about the things that had moved us imperceptibly along the path to that moment, I suddenly understood that the love of literature and the desire which it awakened in me to know and love all things good, true and beautiful were indispensable means of grace in my turning to the Lord, and then I thought of Magdalene Mileski and that afternoon so many years before when I declared that her course was a waste of time. That circle of grace was completed when Raymond and Maggie traveled as pilgrims to Rome for my ordination to the diaconate in 1992 and to Charleston for my ordination to the priesthood in 1993. On the morning of my first Mass, as I wore this chasuble for the first time, I heard Maggie say that it was one of the proudest days of her life: the hidden work of a teacher bearing fruit after long years of loving service. And what is true of my own story is multiplied times beyond reckoning in the lives of generations of students who learned much more than the rules of grammar and composition from Magdalene Mileski. Magdalene Mileski was a loving wife, a devoted sister and aunt, a true friend, and a faithful Christian. And by the grace of God, the gifts of nature, and the discipline of hard work, she was also a great teacher. Her students know it, her friends know it, and God knows it. Not a bad public, that. Thanks be to God for the life of Magdalene Parker Mileski. May Christ Jesus the merciful Savior acknowledge her now as a sheep of his own fold, a lamb of his own flock, a sinner of his own redeeming, and a teacher of his own Gospel. Grant rest, O Lord, to your servant Maggie with all your saints in light, where sorrow and pain are no more, but perfect peace and everlasting life. Amen.